Pent-up demand and favorable silver prices powered opening day sales of the new 2013 American Silver Eagle bullion coins. Sales hit 3,937,000 coins, a total that is the highest for a single day and one that already ranks January 2013 as the fifth strongest month since the American Silver Eagle program debuted in 1986. The four stronger months to beat are January 2012 at 6,107,000; September 2011 at 4,460,500; January 2011 at 6,422,000; and November 2010 at 4,260,000. Bullion coins from the U.S. Mint sell through a network of Authorized Purchasers. AP’s order them in large quantities and resell them for a small profit. In the case of the 99.9% pure Silver Eagles, AP’s pay the Mint $2 per coin plus the market value of silver in them. Newly dated bullion coins are always popular in January, but sales excitement ignited because on Dec. 19 the Mint’s inventory of 2012-dated Silver Eagles sold out. That left AP’s empty-handed for three weeks until the new ones launched today. Also buoying sales are the comparative bargain coin prices when considering that silver has posted a string of six straight weekly declines. Demand has been bullish for the coins in recent years. 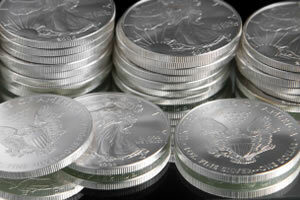 2012 annual American Silver Eagle sales closed at 33,742,500 for the third highest total. They were on track for the second best annual total until the unexpected sell out. 2010 holds that spot at 34,662,500 coins. The highest sales year happened in 2011 with sales of 39,868,500. In related but older coin news, the U.S. Mint started selling the companion 2013 American Gold Eagle bullion coin on Jan. 2, 2013. Opening day sales across the four different sizes totaled 50,000 troy ounces. AP’s have ordered the new 22-karat gold coins every day since released, with the latest year-to-date sales at 71,500 troy ounces. That is already higher than nine different months in 2012.